Alice Springs-based award winning electronic music artist Resin Moon (aka Dave Crowe) launched his captivating EP ‘Salt’ at the Railway Club in Darwin on Friday December 10 to spellbound audience. Resin Moon was supported by two of his peers in the NT EM scene – Broadwing (Ben Allen) with his hauntingly transcendent voice and guitar work and producer Pulzanti opening the show with some slick tracks to get things moving. 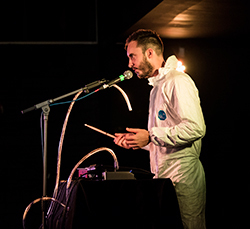 Dressed in a sort of ‘bio-hazard’ suit and singing through a voice synthesiser at times, Resin Moon captivated the Railway Club crowd with his electronica and slick moves. It is hard to command that sort of attention as a soloist at the best of times and Resin Moon did it with ease. Having performed the launch in Alice Springs and now Darwin, Resin Moon’s tour continues on through the eastern States.